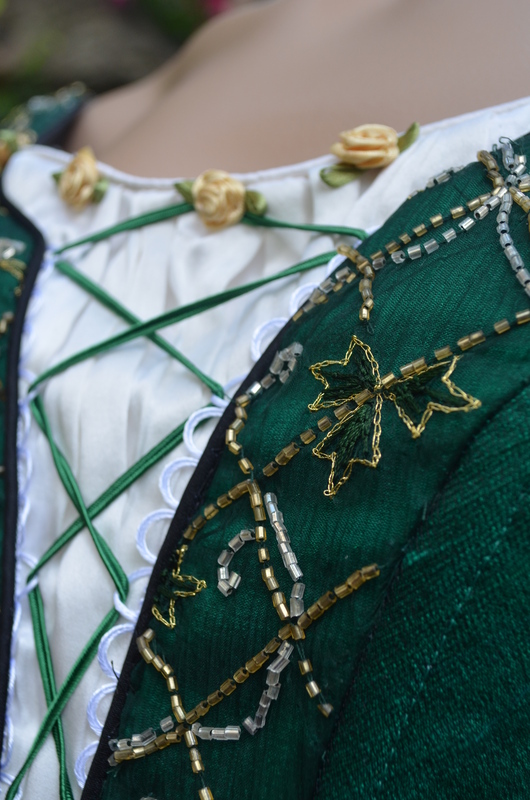 Demi-character costumes scale the depth and breadth of interpretation allowing dancer’s to stretch their acting abilities. What little girl would not want to be Little Red Riding Hood? This sweet little character costume steps away from the typical but keeps Red Riding Hood’s character true. A little princess line dress with a flared skirt allows for all the ballet moves in the choreography. The corset lacing on the bodice adds a little old world charm. Because the costume may be used for other choreography I added a little detail to the sleeves even though it may not be seen once the cape is added. The long mesh sleeves come down across the hand to give greater line. A lace edged petticoat adds a little more sweetness to the costume. 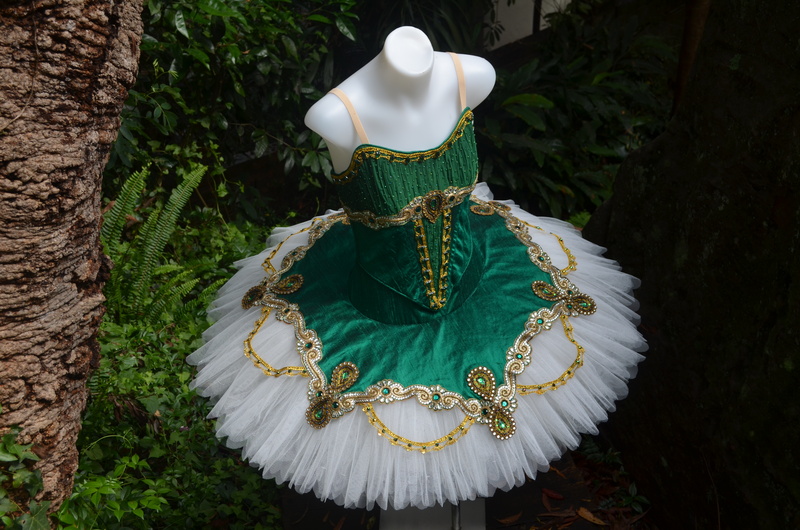 While the classical ballet tutu is the iconic shape for ballet there are a few other costumes that make a regular appearance. The peasant pas dress is one of them. Here are three I made earlier this year; the copper silk for YAGP and the blue silk and russet stretch for Alana Haines in Wellington New Zealand. I loved the bodice detail on this one. Rather than the typical laced corset bodice this one had little horizontal bars. I also found the most perfect coloured roses to give some points of interest to the bodice decoration. 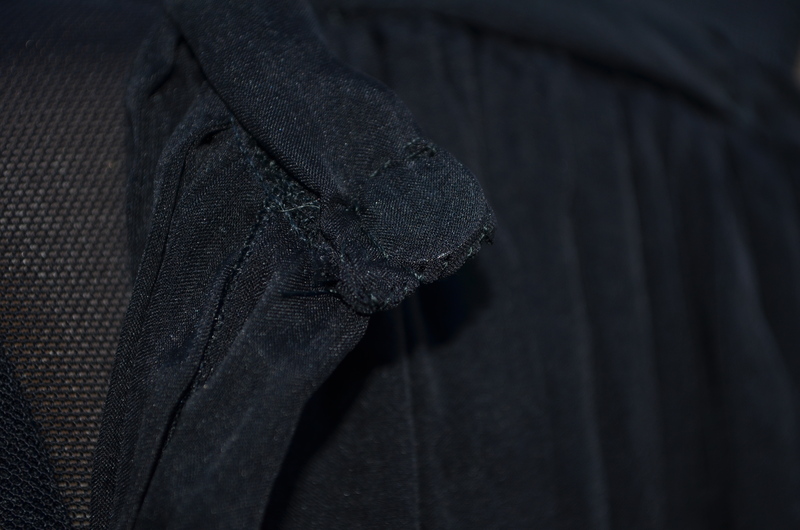 The faux chemise under the bodice is 8mm tissue silk that had been gathered and steamed into rough pleats. This is on of my favourite techniques and I always have 5 metres of this on hand. It’s inexpensive and easy to use. I think it gives a much better effect than polyester chiffon and about the same price. The skirt was not the typical fluffy style but a lower profile dress with just a couple of layers of tulle underneath. The top layer was the same tissue silk because the teacher wanted a lovely soft float to the skirt. I added a few little roses to the sleeves for a tiny splash of colour. The brown guipure lace continues around the back of the bodice. I bought this lace online thinking it was gold and I wondered if I’d ever use it. I think it’s perfect in this application. The costume was shipped to California and I received this photo back. 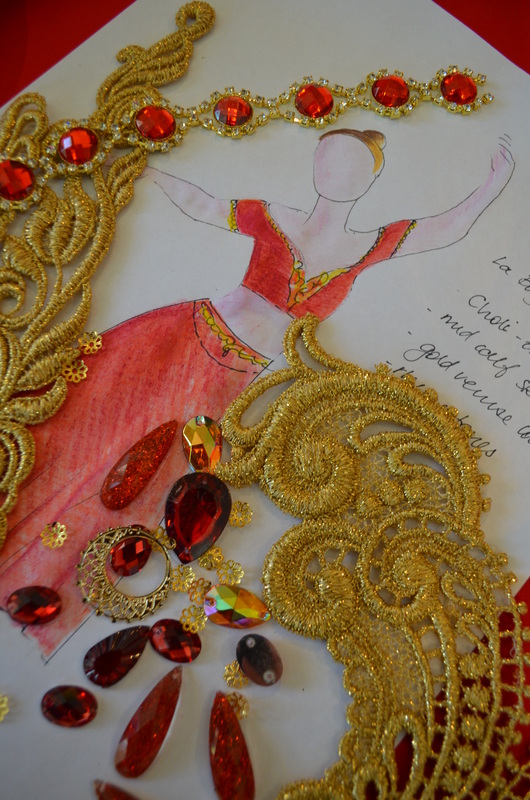 It’s lovely to see my costumes come alive on dancers. The next was another traditional peasant pas with silk bodice but with a romantic tutu rather than a low profile skirt. I couldn’t resist flowers, it is a peasant dress after all. 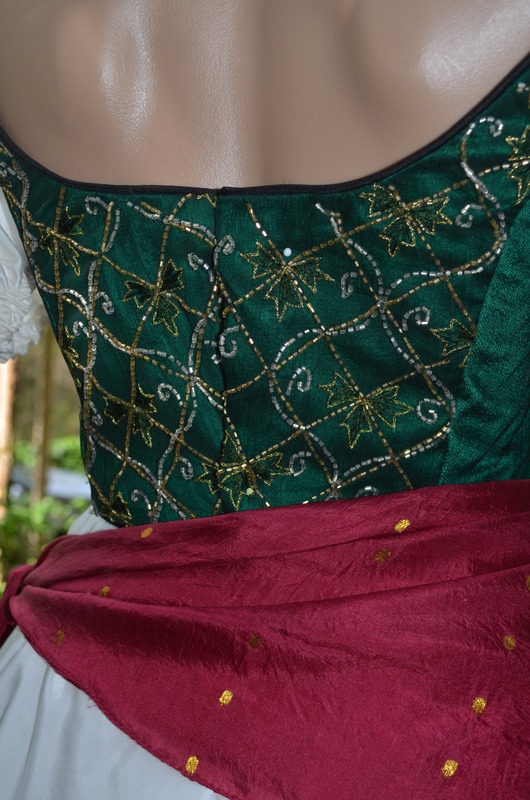 You can see the ruched silk effect again here but the corset is underbust so more of the ruching can be seen. As you can see the skirt is very fluffy. It has 2 layers of bridal tulle on the top 2 layers of dress net underneath. One of the difficulties with these skirts is the tendency of the net to wrap around the legs during turns. My client came back with the dress to see if we could fix it. 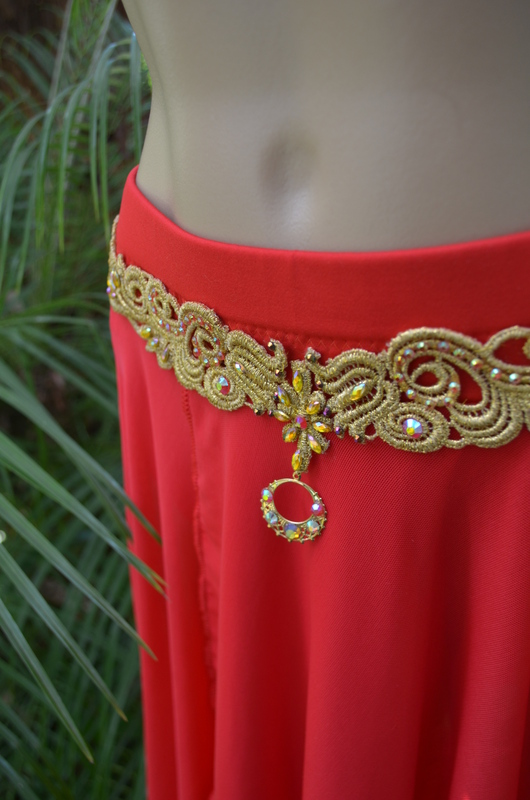 I put in 12 long swing tacks (about 8cm) evenly around the skirt at the level of the ribbon and the problem vanished. The last peasant pas dress I made was a stretch version. This is another of Dani Legge’s terrific patterns. You can see I was again rather taken with the brown guipure lace and the dusty pink roses. 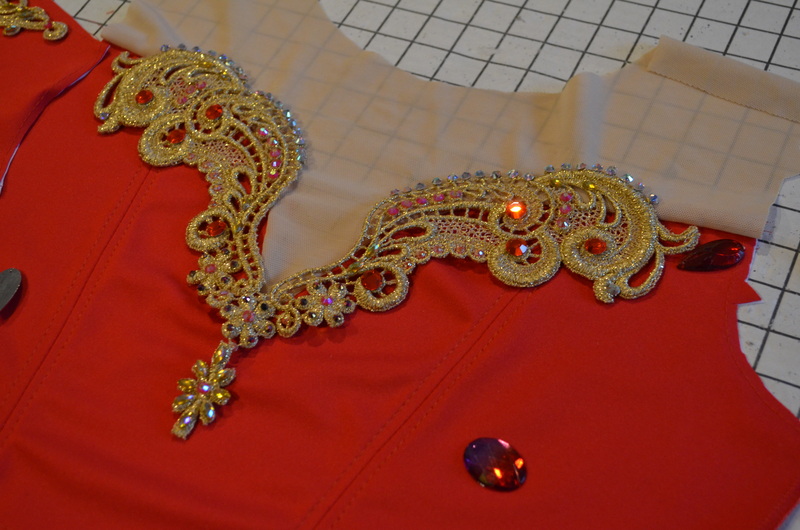 I added a few little carnations as well and a coppery ribbon for the traditional corset lacing. 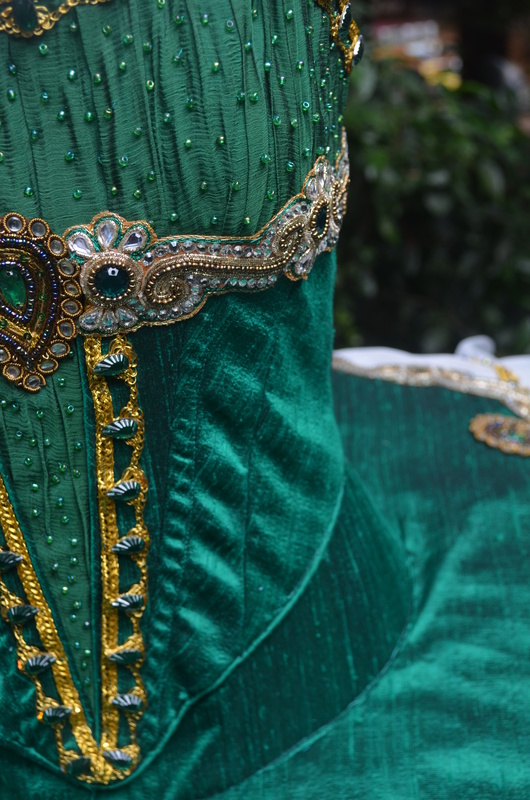 This costume had the traditional apron as well as ribbon trim around the bottom of the skirt. 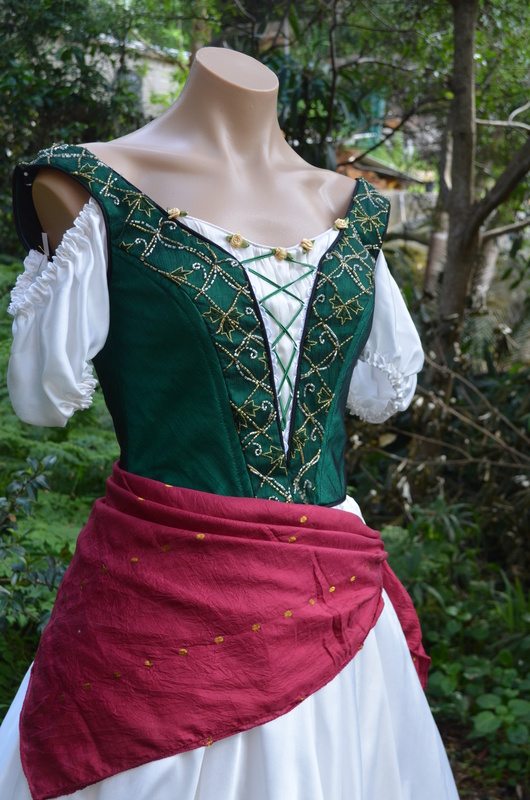 There’s not a lot of requests for peasant pas costumes in Australia. I look forward to Alana Haines 2019 when the next requests come in. I do love requests like this one. 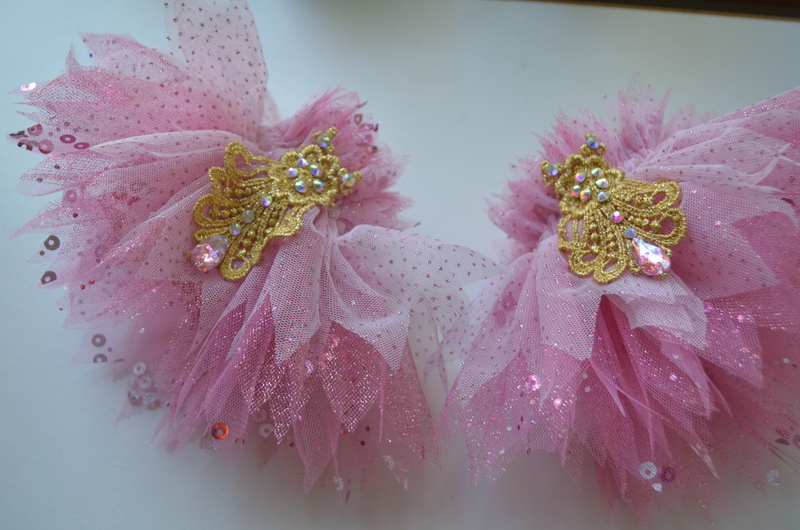 I was asked to make a pink and gold “apprentice fairy” costume with golden wings. 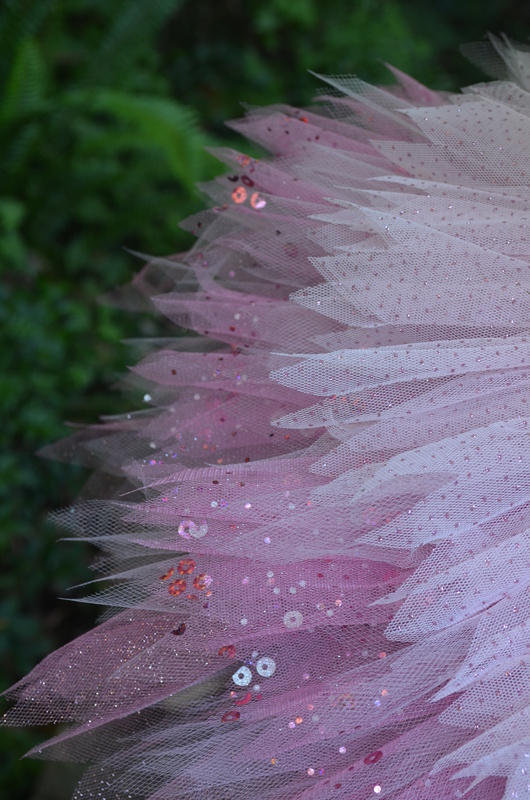 The client and I decided on an upside down tutu, with the shortest layers at the top, in a multitude of pinks. Here’s what I came up with. 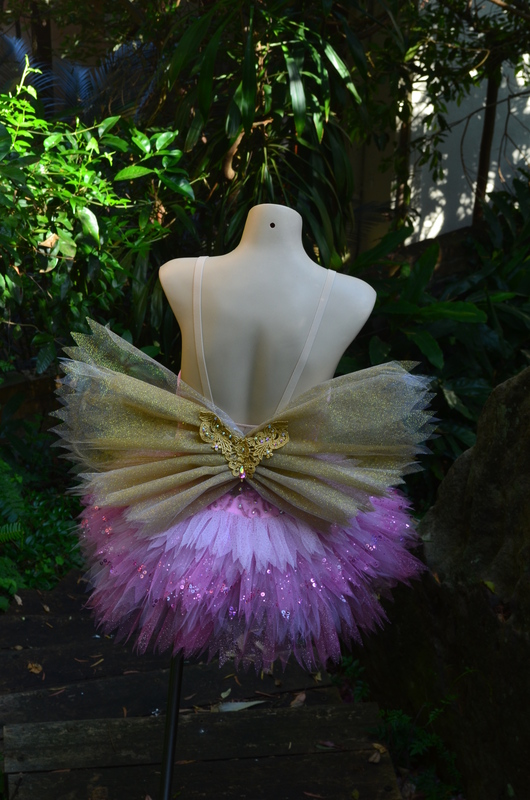 and to give a ballet feel to the costume we added little pink arm frills with gold venise lace to match the bodice. 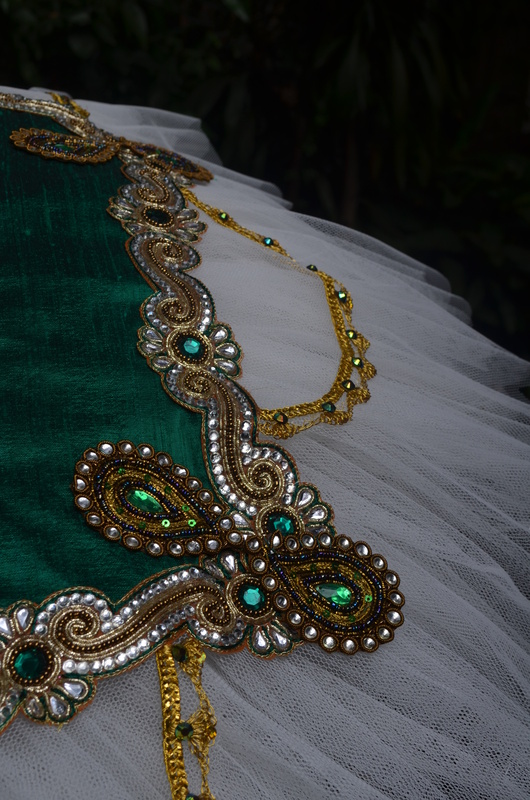 The wings were made from gold stiff net covered with fine gold glitter tulle. 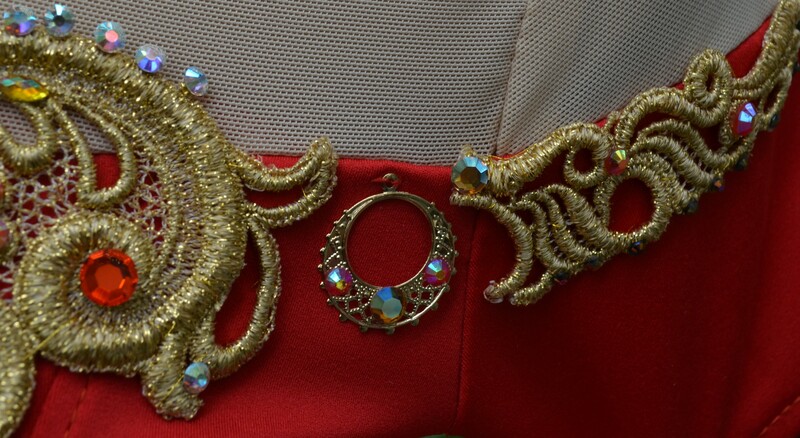 I used a little more venise lace to tie all the costume elements together. 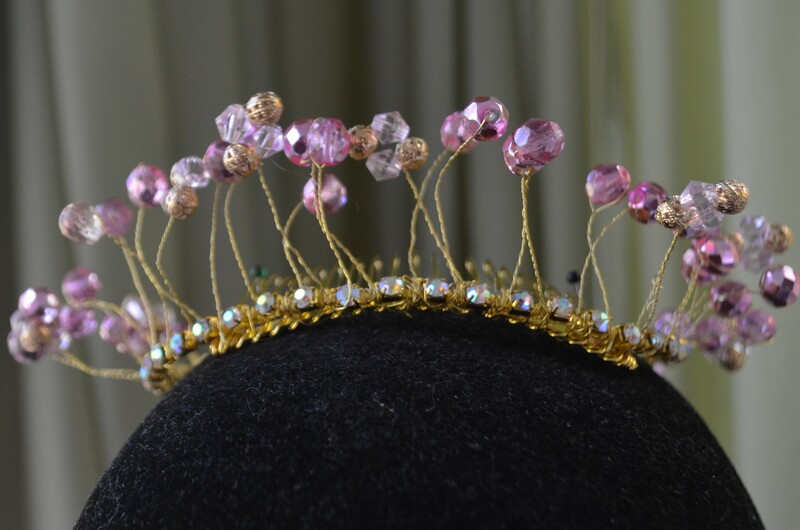 I added a little pink dew drop tiara. The sweet little fairy looked so gorgeous on the back steps in my garden. A client came to me a while ago for a tutu and asked if I’d make her a Maleficent costume as well. They wanted wings that could be easily removed in the early part of the choreography. 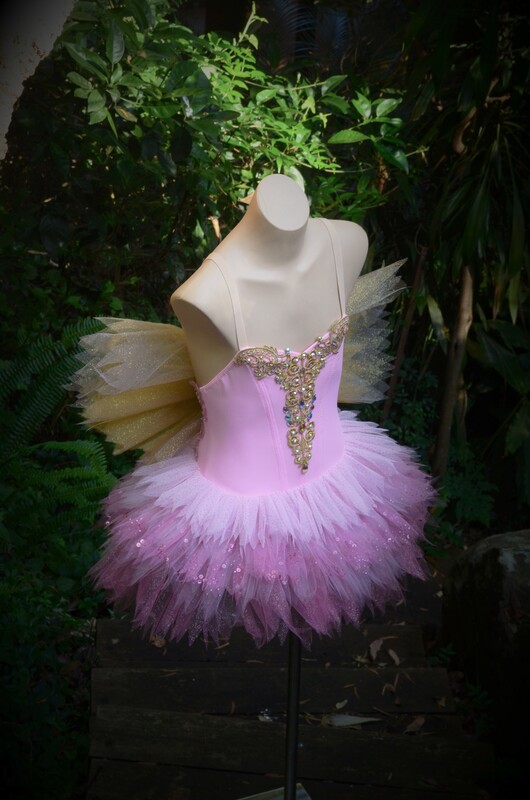 Now before you get too excited, I don’t know ow to make wings and certainly not easily removable ones so I accepted the tutu job but sent them off to a costumier I knew in Bondi that does this sort of thing. When they cam back for a tutu fitting they said they’d changed their mind about wings and could I make a costume with a removable long floaty cape. Oh yes … now that was right up my alley. Three metres of 6 momme tissue silk and a handful of magnets and here we go! Anything that is removed on stage in front of an audience needs to be done deftly and silently. Velcro won’t do it and snaps need serious pull to dislodge. For quick change costumes you best friend is a magnet. 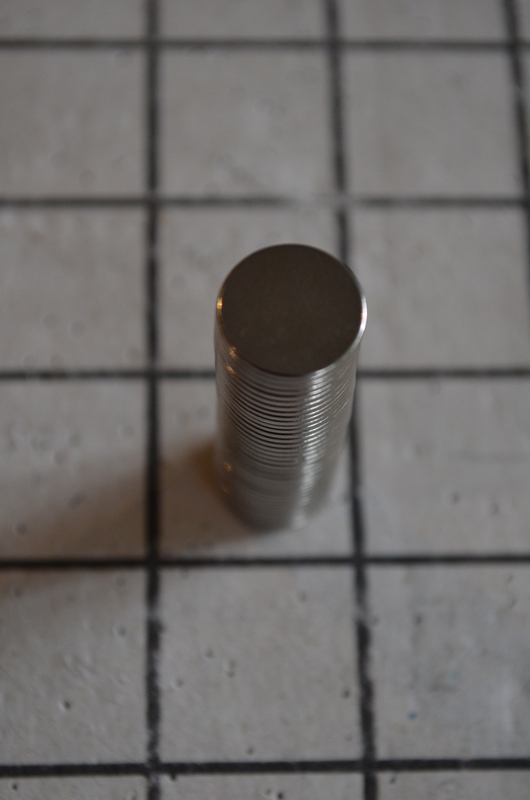 I use 12mm x 2mm neodimium magnets. They have a pull of about 600g and with 6 pairs of them I figured it would be enough for 3 metres of beautiful floaty tissue silk. The magnets had to be placed inside the black mesh of a unitard so I covered them with flesh coloured powernet and sewed them into the costume across the back of the shoulders. My aim was to have as little fabric as possible between the north and south poles of the magnets (It’s important to get that right!) 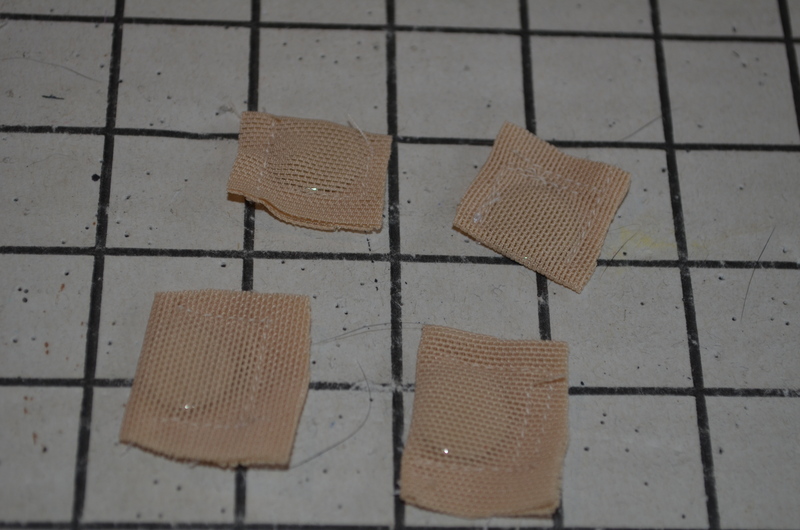 so I didn’t sew them over seams. Now while the magnets can be seen close up, at 5m they disappear and considering the audience is generally at 15 m they are for all intents and purposes invisible. 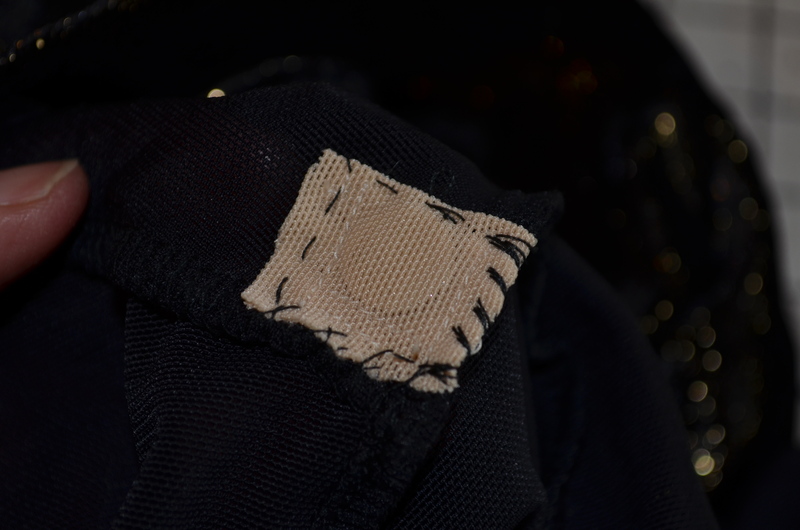 The matching pair of the magnet was in the edge of the cape with just one layer of silk over it. 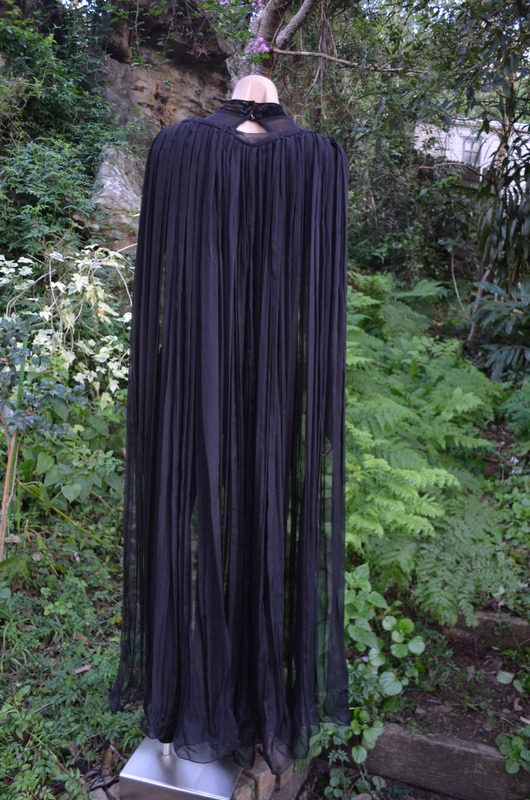 The magnets in the cape and across the back of the costume lined up and gave the look of a firmly fixed cape. 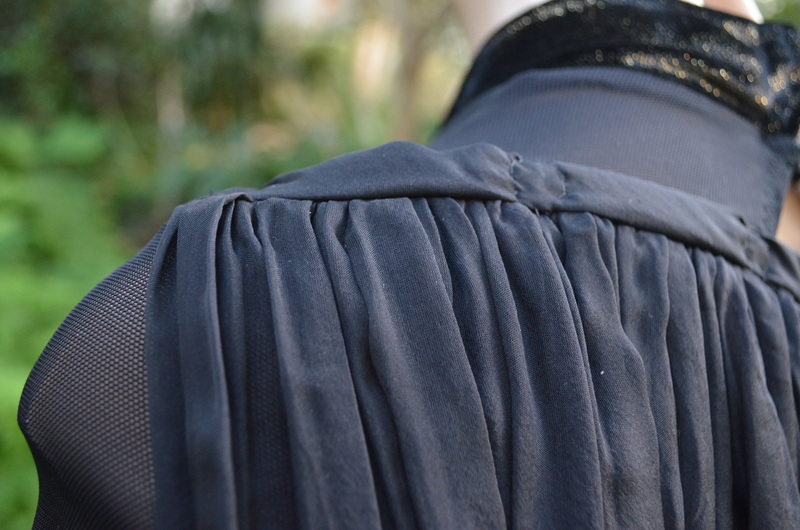 The cape is 1.5 m long and 3m wide gathered and steamed onto a band the width of the back. Small magnets were also inserted into the wrist of the costume to give the impression of wings: Mission accomplished .. and NO WINGS! 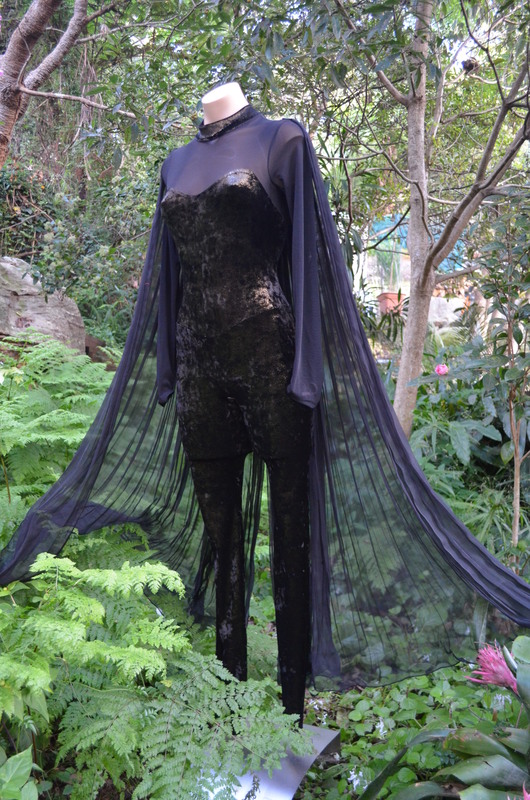 When the cape is removed a deep low back is revealed on a black velvet unitard with gold embossing. Maleficent with her evil black silk cape. This time of year I am extremely busy with costumes (hence so few posts at the moment sorry) and it’s sad when I have to turn people away. Although this costume request came in very late I had a postponement so I managed to squeeze this little temple dancer in. 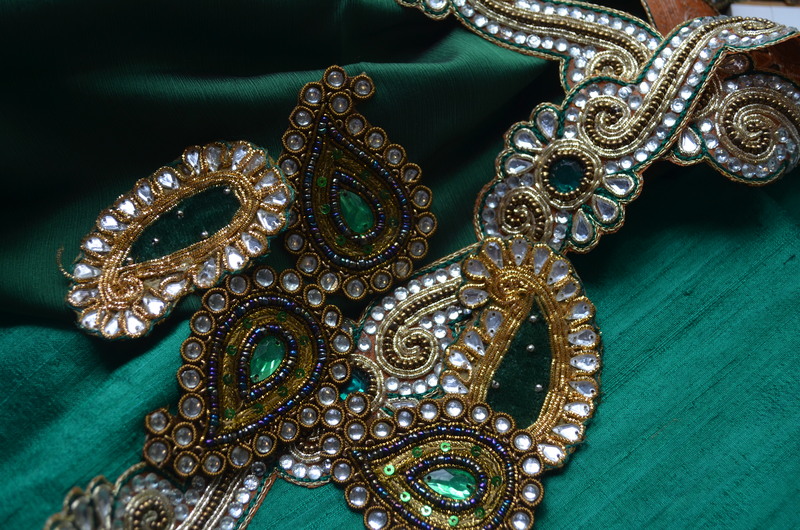 The costume is based loosely on an Indian choli and lehenga skirt. It was a great opportunity to dig out lots of rhinestones and jewelry findings. 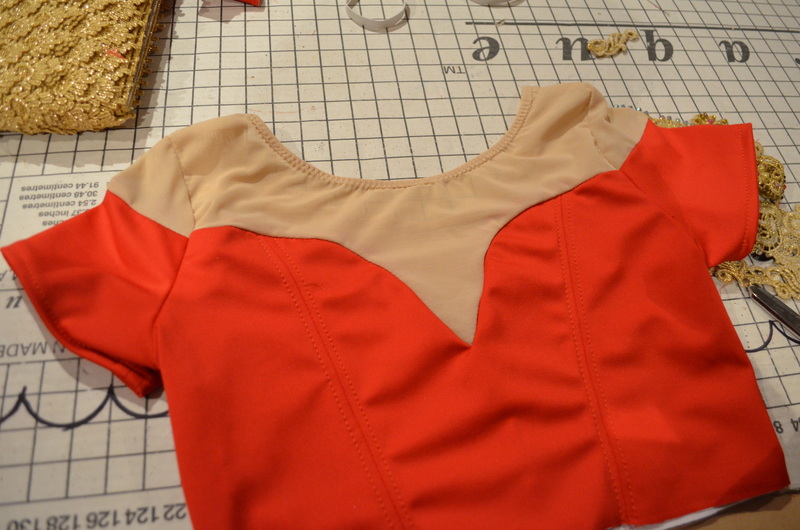 I cut the very centre from an applique to give a nice shape to the deep V neckline. That’s it sitting at the bottom of the applique. The next step was my favourite … bling time! 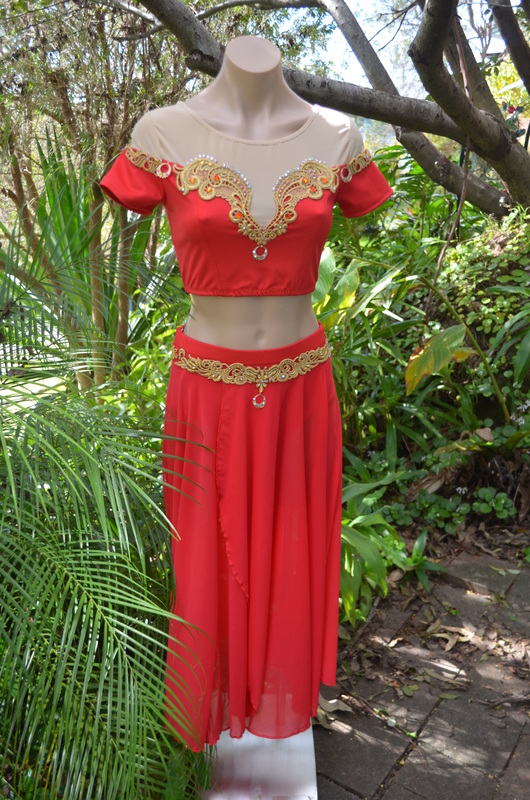 Traditionally the choli has a scoop neck and set in sleeves but we decided to tweak that and give an off the shoulder look and a deep V neckline by making the top of the choli from flesh mesh. 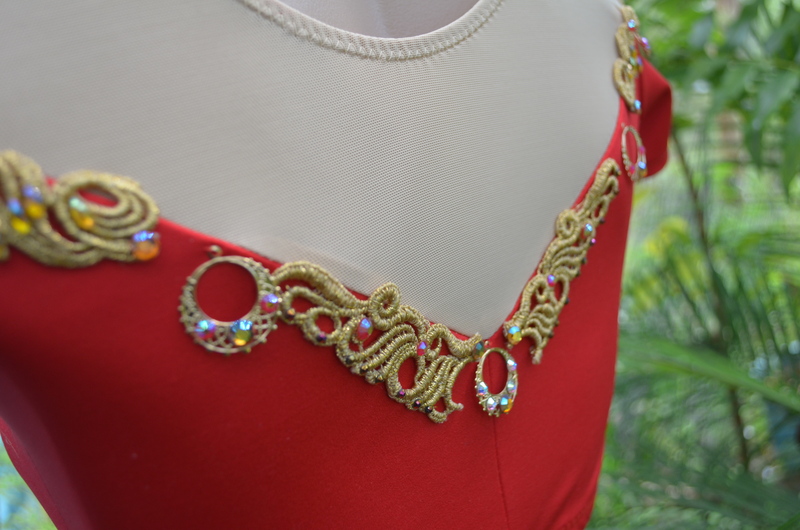 I didn’t have quite enough venise lace to go all the way around the top of the bodice so I sneaked in a few earring findings that I’d blinged up. 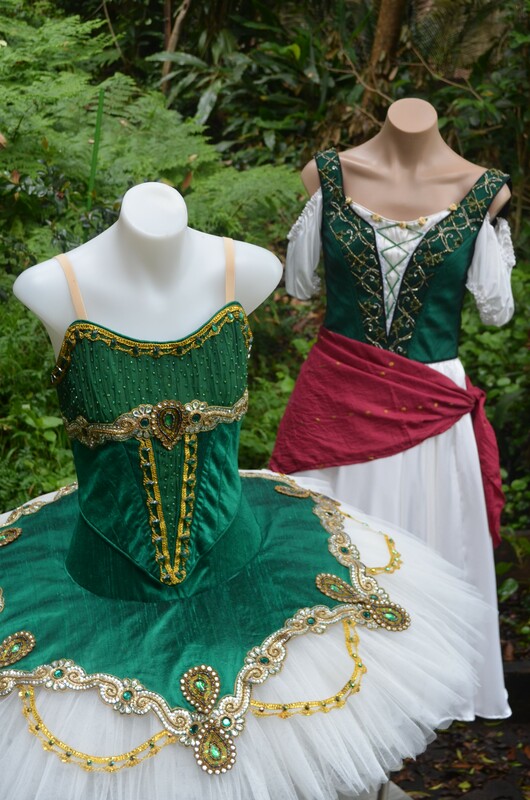 The costume came together beautifully and will be in the post tomorrow to make its way to Victoria. 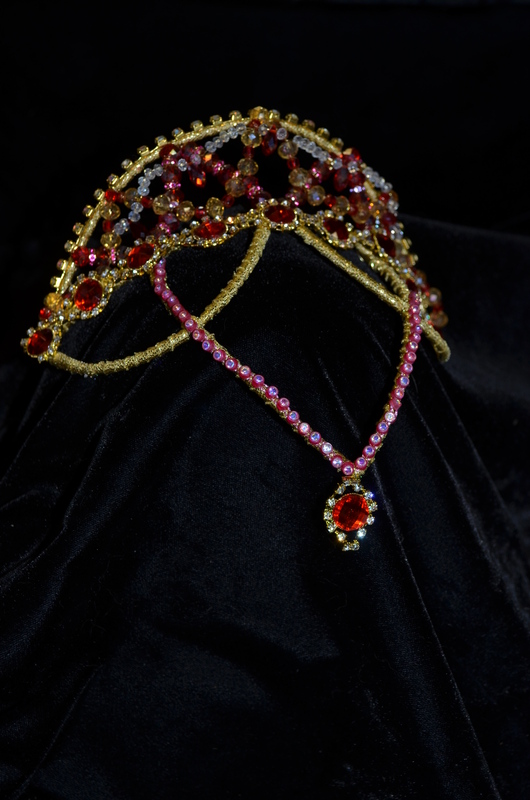 and of course an ornate tiara to finish everything off.